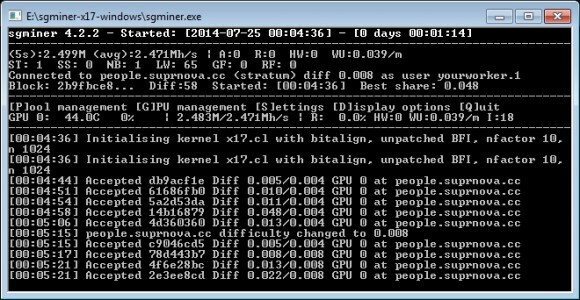 There is now a new fork of sgminer 5.0 beta that brings x17 algorithm support for mining crypto currencies such as People’s Coin (PPL) on AMD-based GPUs. The new fork is by the developer of the PPL coin (source) and it completest the GPU support along with the already available ccminer X17 fork by djm34 for Nvidia GPUs. We have compiled a windows binary from the latest source of the miner and tested it on an AMD Radeon R9 280X GPU getting almost 2500 KHS. You can download and try the windows binary yourself from the link below. Do note it is recommended to be using the latest 14.6/14.7 beta drivers from AMD in order to get the best performance. Copyright ©2014-2019 - Crypto Mining Blog - All About BTC, LTC, ETH, ZEC mining as well as other alternative crypto currencies. This is a blog for crypto currency miners and users of Bitcoin (BTC), Litecoin (LTC), Ethereum (ETH), ZCash (ZEC) and many others.